Posted October 12th, 2015 by Mike Boyes & filed under Abnormal Psychology, Clinical Neuropsychology, Clinical Psychology, Eating Disorders, Intervention: Children Adolescents, Neuroscience, Physiology, Research Methods, Treatment of Psychological Disorders. 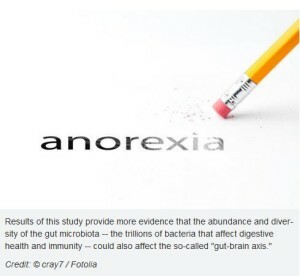 Description: It turns out that individuals struggling with anorexia seem to have a narrower array of microbes in their gut than do people without the disorder. What might this observed relationship suggest? In this study a small group of individuals struggling with anorexia were assessed at admission to a treatment facility and specifically had stool samples taken and assayed in order to determine the nature and complexity of the bacteria living in their gut. What was consistently found was that these individuals upon admission for treatment for anorexia had lower bacteria counts and less complexity in the types of bacteria found in their gut at admission. Further it was found upon discharge that the nature and complexity of the bacteria in their gut had increased significantly and move much closer to what would otherwise be considered normal levels. As you can imagine the authors speculate as to the nature and potential causal direction of this relationship will and whether or not it might suggest addition to the treatment of anorexia. While this might seem entirely correlational, has been quite a bit of work lately pointing to a relationship between the gut and the brain, referred to as the gut brain axis and suggesting what happens in the gut may have implications for what happens in the brain. Pärtty, A., Kalliomäki, M., Wacklin, P., Salminen, S., & Isolauri, E. (2015). A possible link between early probiotic intervention and the risk of neuropsychiatric disorders later in childhood: a randomized trial. Pediatric research, 77(6), 823-828.